Drive Medical Bariatric Drop Arm Bedside Commode Chair has a weight capacity of up to 1000 lbs, which makes it the perfect seat for large patients. 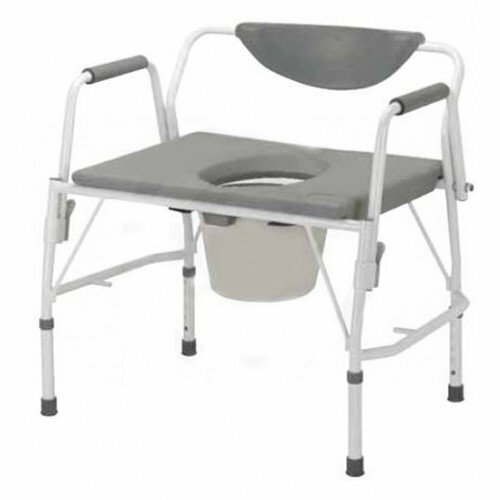 It is designed as a heavy-duty commode with extra space for maximum comfort. It is designed with a deep and wide seat and features padded arms and backrest. The Drive Medical 11135-1 Bariatric Commode Chair features durable armrests that provide a sturdy and safe handle to assist with sitting and standing. It comes with tool-free drop arms that make lateral transfer easy for individuals who require the use of a wheelchair. It is constructed out of grey powder coated steel that allows it to be ultra strong and stable. It comes with an extra large, removable commode bucket. You may also be interested in some of our commode accessories, such as the Sani Bag+ Commode Liner and the MedLine Commode Liners. The weight limit from the manufacturer is 1000 pounds. There is no height limit listed. This commode chair is especially designed for bariatric patients. With its easy to release arm mechanism, it is proven safe for lateral transfer of patients whether to or from the commode. Its large and sturdy seat can be easily cleaned and maintained. What also makes this commode special is that it has a padded armrest and backrest for comfort.